Every once in a while a new company tries to enter the computer enthusiast market and this year one of the hottest newcomers is BitFenix. This startup is based in Taiwan and the people behind it have learned the ropes at well-known firms, a good chunk of the BitFenix team worked at Cooler Master to create the HAF and Scout cases, and a couple of former ABIT veterans are also included in its ranks! Rising out of the ashes like the mythical firebird, BitFenix hopes to take the market by storm by offering high-quality, innovative products that put the user in complete control. The launch of this company reminded me a bit of how the designers of Cooler Master's ATCS case division left to setup their own company called SilverStone, so naturally I was quite excited to check out the first product from BitFenix: the Colossus. The BitFenix Colossus is a full-tower case for gamers and PC enthusiasts, the company strongly focused on design and promises unmatched expandability, security, and cooling all wrapped up in a modern and elegant body. The Colossus is available in two versions, there's the usual all-black version and for those who prefer light colors the company has created a model with all-white exterior and interior. 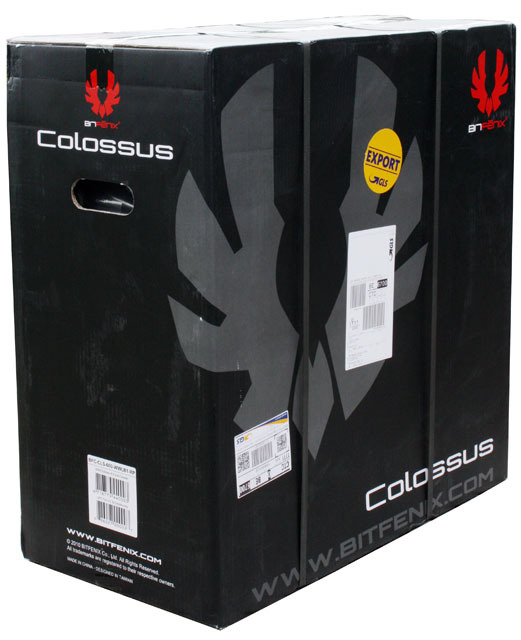 Before I take a closer look at the Colossus I'd like to thank Caseking for making this review possible, they are one of BitFenix' main distributors in Europe. The Colossus ships in a nice black box, and is well protected by blocks of foam and a plastic bag to ensure it doesn't get damaged or scratched during shipping. Please note that the version I received is a pre-production model. The company has made changes to the retail version based on the input it received from early reviews, so many of the flaws I experienced should not be present in the final version of this case, but more about that will follow later on in this review. The case is very tall and has a distinctive design, it has a dark grey color and the white plastic "waves" of the Colossus' LED light system are one of the main eye catchers. While lifting the case out of the box I noticed one of the main disadvantages of the Colossus, it's mainly made out of steel and due to its massive size and solid construction it weighs a ton. With a weight of approx. 16kg it's one of the heaviest cases I've had my hands on, with exception of the Cooler Master Cosmos but that case had handles to make it easier to transport. 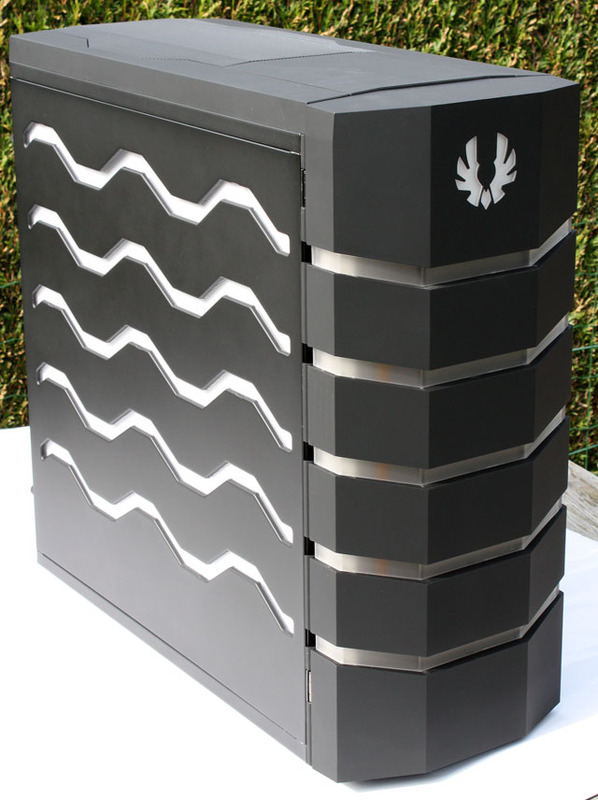 The front of the case prominently features BitFenix' logo, which resembles a bird with large stretched out wings. The case has a dark grey exterior and a large chunk of the front and top panel features a special rubberized coating that is very soft to touch. It's not something you'd expect to find on a computer case, these kind of coatings are usually found on the rear side of consumer electronic devices. When designing cases companies have to make several choices, and for the Colossus it was decided to go with a door that covers the full front of the case. The benefit of doors is that enables you to design cases with a very slick front that hides ugly 5.25" or 3.5" devices, but the downside is that it restricts airflow. The door is made out of hard plastic and by default it opens to the left, but if you like you can swap it to the right.